Frequently Asked Questions regarding SAP, EPC's, PEA's and Code. I have broken the questions up into two sections, Energy and Code for Sustainable Homes. Q: What is a SAP Calculation? SAP stands for "Standard Assessment Procedure", the Government’s approved procedure for energy rating domestic dwellings. Properties are awarded a rating between 1 to 100, although a dwelling may exceed 100 with the assistance of using renewable technology. Q: When is a SAP calculation required? Q: How do you calculate the energy rating? Once the property has been constructed, an additional assessment must be completed, and is called the As Built DER. Q: When should I have the assessment done? It is imperative to have the assessment carried out before any construction work commences in case any alterations are required to the design. This allows the greatest flexibility in materials and cost to our clients. From 6th April 2008, all new build domestic dwellings completed after this date will automatically require an EPC for inclusion into a Home Information Pack (HIP). 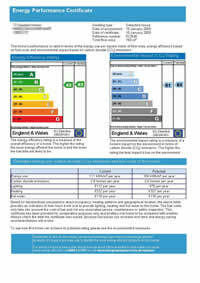 Only authorised On Construction Domestic Energy Assessors (OCDEA’s) are able to produce EPC’s. Q: What is an EPC and when do I need one? EPC's for new build dwellings can only be produced by On Construction Domestic Energy Assessors (OCDEA's) who are accredited by a Government approved scheme. Q: What is a PEA? A Predicted Energy Assessment is a certificate that is produced when the Design Final SAP calculation has been submitted. If you are marketing the property before the As Built Final calculation has been carried out (i.e selling off of plan) then you will need to incorporate the PEA into the HIP’s pack and then replace it with the EPC once it has been produced. PEA's can only be produced by On Construction Domestic Energy Assessors (OCDEA's) who are accredited by a Government approved scheme. Q: What is a Building Regulations Checklist? This checklist is produced by On Construction Domestic Energy Assessors (OCDEA's) and presented to the Building Control Body to demonstrate a property’s Part L1A compliance with the Building Regulations. The Building Control Body will accept these submissions from an OCDEA without question. Q: May I have a SAP assessment on my Nursing Home or similar residential property? The energy use of a Nursing Home will be very different from the standard domestic pattern and as such precludes the use of SAP. Q: I have more questions to ask, what can I do? Feel free to contact Colin Padwick of SapCode on 01604 875005 for an informal chat or use the contact form to send an email. Q: What is Code for Sustainable Homes? The Code for Sustainable Homes (CSH) is an environmental assessment rating method for new homes which assesses the environmental performance in a two stage process using objective criteria and verification. The results of the Code Assessment are recorded on a certificate assigned to the dwelling. Q: What are the two stages of CSH? A dwelling is assessed at Design stage (the first stage) and then reassessed once the dwelling has been constructed (Post Construction Review). Q: What is a dwelling assessed on for CSH? Depending on the scores you achieve on each of the categories the property will attain one of six levels. Q: What are the scores needed for the six Code for Sustainable Homes levels? Above regulatory standards, similar to EcoHomes “Pass” and EST Good Practice for energy efficiency. Broadly similar to Ecohomes “Very Good”, Similar to EST Best Practice for energy efficiency. Current exemplary performance with high levels of energy and water efficiency. Aspirational standard based on zero carbon emissions for the dwelling and high performance across environmental categories. Q: Do I need to have all categories assessed? It depends on which level you wish to achieve. The mandatory categories will always need to be assessed, the other categories can be brought into place to achieve a higher score as needed. Q: Is it ok just to achieve the minimum score for a level? It is unwise just to scratch into a level at design stage. If something occurs during the build that affects the score (e.g. some materials could not be obtained from a suitably green source) the post construction review will pick it up and the revised score may mean that you drop to a lower level. This could mean that you are in contravention of a planning condition on your project. If you start with a score above the minimum for the required level then even with the unexpected issue you may still achieve the required level. Q: Can anyone produce a Code for Sustainable Homes rating Certificate? Only a licenced assessor can carry out and certify a property for Code for Sustainable Homes. SapCode is licensed for CSH.